If you're interested in tuition but would prefer something more personally catered then I'm available on a one-to-one basis. We'll head into the Mournes for the day where I'll cover all technical, compositional and location aspects with the aim of shooting shooting a sunrise or sunset. Join Alistair Hamill and I for the evening as we photograph one of the finest views in the entire Mournes. On this workshop I'll cover technical aspects and impart my knowledge about how best to frame and compose the views of the valley below. Join Alistair Hamill and I for this unique summer solstice workshop in the heart of the Mournes. 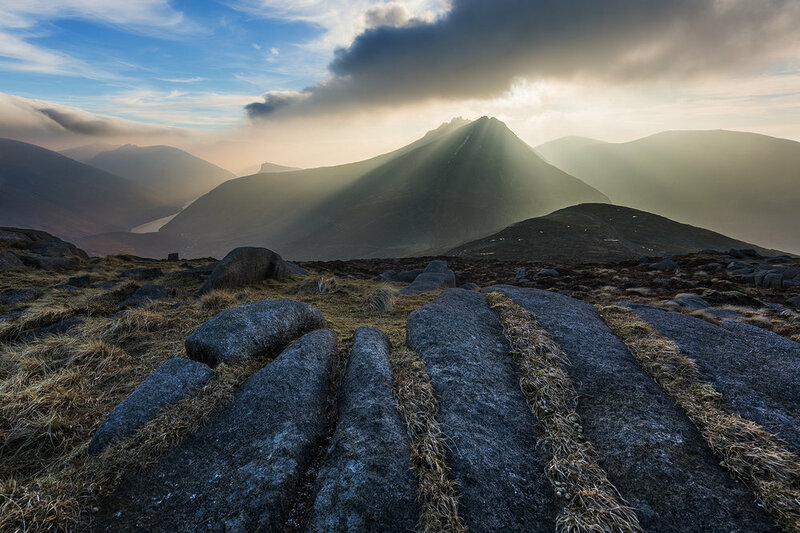 The month of June typically offers the best weather and we’ll be aiming to photograph late into the evening all the while supping on hot drinks from a truly incredible part of the Mournes. Join me for this summer solstice workshop on one of the most photogenic summits in the whole of the Mournes. I’ll be showing you how to capture the various rocky outcrops and spectacular vistas that this make this a spot you’ll want to return to again and again. Without doubt one of the unique characteristics of the Mournes is it’s spectacular prominent setting on the edge of the Irish Sea. Join me for this summer coast workshop where we’ll capture these mountains from sunset through into the evening twilight. 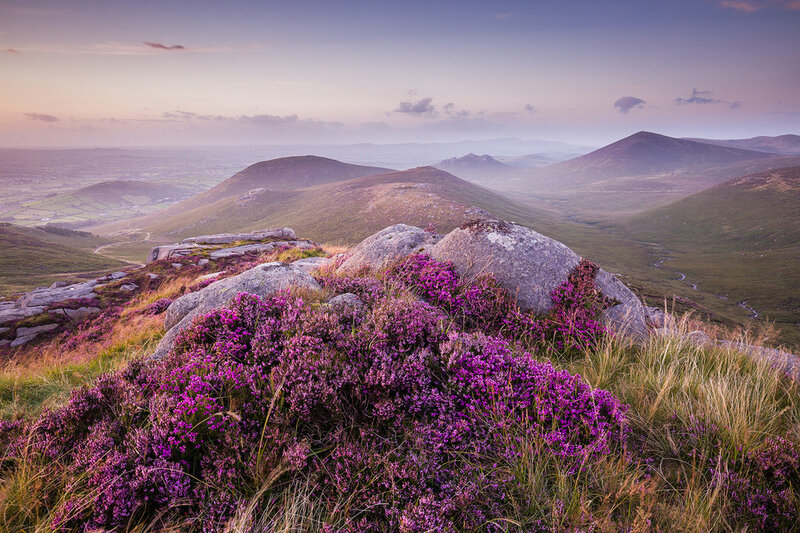 The western Mournes are characterised by sweeping hills and gentler walks, however the views are no less pleasing. Join me at Pierces Castle for the evening as we photograph the purple heather looking down the valley towards Hen mountain. Join Stephen Wallace and I for this end of summer workshop as we take in the spectacular surroundings of the Annalong Valley and Buzzard's Roost. This workshop packs in a variety of epic locations, with the day culminating at the viewpoint overlooking Ben Crom reservoir. WHAT IS IT AND SHOULD I GET INVOLVED? Be a part of the first photography workshops of their kind in Northern Ireland as we guide you through the province's most dramatic mountain landscape. These are going to be a unique series of one day, adventure based workshops geared towards every level of photographer. I'm delighted to be teaming up with two friends that I've hiked and photographed this area regularly with over the past number of years- Alistair Hamill and Stephen Wallace. Between us we combine many hundreds of hours of hiking time, but more important still is the comprehensive knowledge of the area shared between us that we believe will create an experience that is memorable and enriching for those taking part. You won’t have to be an accomplished hiker or hill-walker to be involved with these workshops as we’ll be arranging them according to your individual ability. Get in touch with us beforehand if you have any reservations whatsoever. Using our knowledge and experience, we'll be guiding you to what we know to be the best locations with the best potential for lighting conditions. We'll be with you throughout the day to offer on-location tuition: Setting up, Technical Demonstrations and Compositional Advice. You'll be required to make your own way to the group meeting point. This will be an informal introduction with hot drinks and a general discussion on what to expect from the day ahead.